Let them thrive in the oceans, opt for sustainable seafood in the new year. Chinese New Year is just around the corner, we wish you a happy and healthy new year. When we are preparing a series of celebration and blessings to friends and families, letâ€™s not forget about our marine environments. We are delighted to see more people taking out shark fin from their banquet menus or from other gatherings, thanks to the efforts of many environmental groups. If you love eating groupers, especially Hong Kong groupers or Squaretail coral trout, you may have to think twice. Please take a few minutes to read why we say so. Below is one of the updates we hear from 2016/17 funded projects, thank you Prof. Yvonne Sadovy de Micheson of The University of Hong Kong for sharing with us. The International Union for Conservation of Nature (IUCN) is a conservation union, made up of national governments and NGOs. It is probably best known for the Red List, indicating the conservation status and extinction risks of tens of thousands of species of plants and animals which have been assessed by experts into Specialist Groups under the umbrella of the Species Survival Commission (SSC). 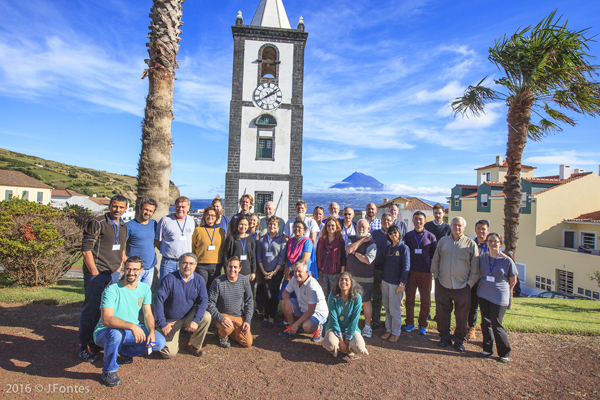 The Groupers & Wrasses Specialist Group (GWSG), which contains many of the world's grouper experts, met during November 16 to 21, 2016 in Faial island, Azores, Portugal to assess all 164 species in this group globally. There were 35 experts from 13 countries or regions involved in the workshop. This is only the second time in a decade that this specialist group has assembled after the first in 2007 in Hong Kong when most of these species were assessed for the first time globally. 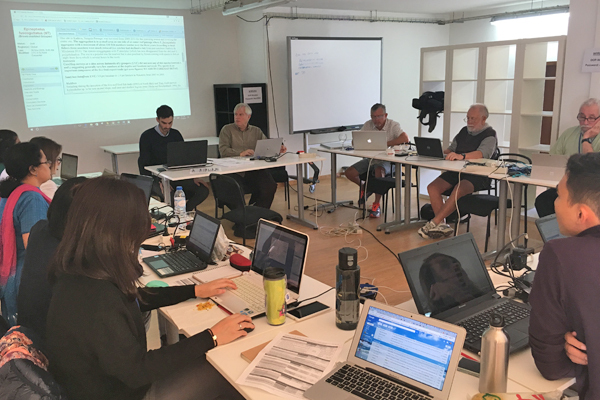 The Azores workshop, supported by the IUCN Biodiversity Unit staff, is key because Red List re-assessments must be completed at least once every ten years. In fact, it is the first time that a marine specialist group is undergoing a global reassessment to determine any changes over a decade. 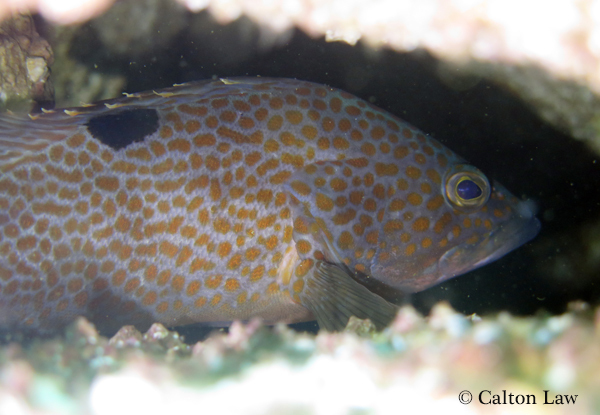 In the case of groupers, revisiting their condition is particularly significant because of growing exploitation pressure on this group of fishes, which are so important for livelihoods and as a source of food in many locations around the globe. Few groupers seem to be monitored regularly, few are managed effectively, and many are declining. Because of their biology of slow maturation, long life and frequent spawning aggregations, many of these species are particularly vulnerable to overfishing so there are great concerns about declining populations. During the workshop, experts reviewed the current condition of this group and identified those species in higher risk of extinction in the future to help move towards more sustainable practices. The preliminary/draft workshop assessments reflect growing concerns for the condition of several grouper species and especially those that are heavily exploited when aggregating to spawn. Some of these species are frequently occurs in live reef food fish trading in Hong Kong, for example, Hong Kong grouper (Epinephelus akaara), Camouflage grouper (Epinephelus polyphekadion) and Squaretail coral trout (Plectropomus areolatus). GWSG also recognises the urgent need to collect better data on grouper fisheries and to manage them much more effectively than we do today if we are to have them into the future. The workshop was co-organised by the GWSG, Institute of Marine Research based at the University of the Azores and Marine and Environmental Sciences Centre, and was funded by the Ocean Park Conservation Foundation, Hong Kong, the Mohamed bin Zayed Fund, The University of Hong Kong and the Regional Government of the Azores. 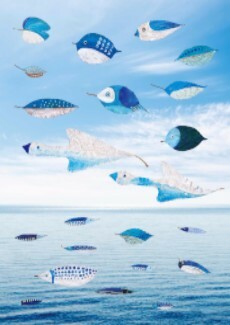 In this new year, letâ€™s bring fortune not just to ourselves, but also our marine environments. Feel like running 10km with your colleagues and competing for a champion cup? In the third year of our Run For Survival event, weâ€™re introducing the Champion Cup for corporations to compete in. With a donation of HKD6,000, you could register as a team of 4 to 6 participants. The fastest corporate team (based on total running time of the fastest 4 runners only) will win the Champion Cup whilst its members will be awarded one Ocean Park admission ticket each. Itâ€™s a perfect occasion of staff engagement and team building! Register now to run with your co-workers, race as one of the marine animals struggling to survival in the oceans, and reflect on how you could help them in daily lives. See you on February 26, 2017! Mamasmart joins us this year in advocating a greener lifestyle with less plastic disposables consumption. 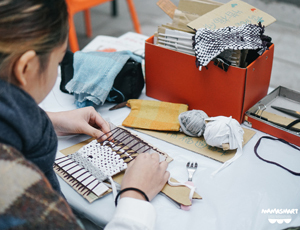 Environmental friendly markets and up-cycling workshops will introduce you to a more sustainable way of life with alternatives replacing plastics to combat the issue of marine debris! 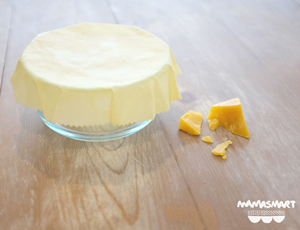 Say goodbye to cling film and plastic wraps! In this tutorial you will learn how to make your own sustainable food wrap with solely natural materials - cotton and beeswax - which will be better for both your body and the environment. By using recycled cardboard and old rag, we can easily create wiping cloths that are both pretty and functional! We will also teach about how to pair this up with natural cleaning agent to achieve best cleaning results. There will be no more harsh chemicals, plastic bottles and polymer sponges in your kitchen! Participants will be taught how to draw beautiful marine animals on fallen leaves collected from surrounding parks. Please follow our news on OPCFHK Facebook page to learn about the registration information. iii. 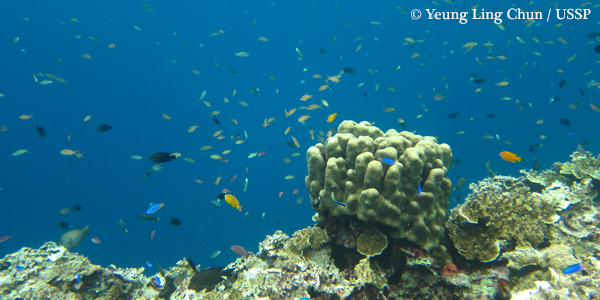 Conduct ex-situ studies on the target species to promote in-situ conservation efforts. ii. Conduct capacity-building programmes or workshops to advance the nature reserve and conservation education teamsâ€™ knowledge and skills for effective conservation action. With limited available funds and given the urgency of conservation efforts, it is important that research studies are designed to be effective for conservation. Priority will be given to threatened Asian species listed in the IUCN Red List categories of Critically Endangered, Endangered and Vulnerable. Worthwhile projects addressing species in the Data Deficient or Near Threatened categories will also be considered. Please refer to the Foundationâ€™s website for more information. Application will close on January 31, 2017. 2016 is a significant year for Planet Earth. On Earth Day in April, over 170 recognised countries signed The Paris Agreement on Climate Change which has entered into force in November, marking the first time that governments have agreed legally binding limits to global temperature rises. The IUCN World Conservation Congress in September outlined opportunities to address some of the greatest challenges facing nature conservation and called for a commitment to implement them, whilst the 17th meeting of the Conference of the Parties of the CITES ended in October resolved for tightened control on the trade on some species, for example uplisting 8 species of pangolin into Appendix I, and including silky shark, 9 species of mobula rays and 3 species of thresher sharks into Appendix II. Protection of species and the environment require international, regional and local efforts from the governments, science communities and local people, as well as corporations and individuals. We, at OPCFHK, focus on conservation efforts in Asian region. We are proud of what we have been able to accomplish in the 2015/16 financial year, as you could see from our newly published annual report, with our scientific projects, and our conservation education and public awareness programmes â€“ over 22 animal species in Asia, and over 128,000 students and members of the general public have benefitted from our funding and programmes. All of this would not be possible without your support - as our donors, sponsors, volunteers and supporters. The Chinese white dolphin (CWD) has been a key focal species of the Foundation. In 2015/16 financial year, three populations were under study: in the Pearl River Estuary (PRE), Xiamen and Sanya, Mainland China. 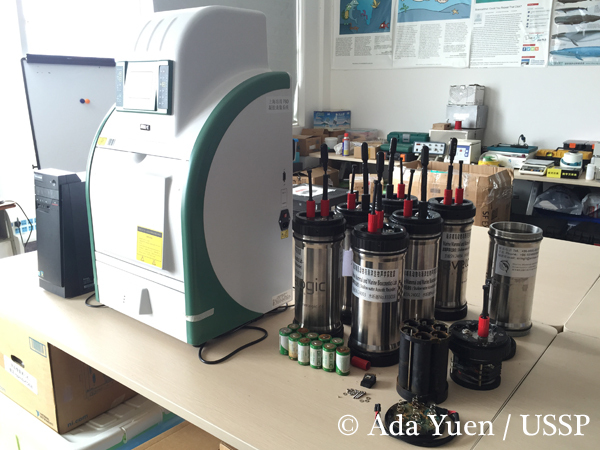 Our funding to Sanya Institute of Deep-sea Science and Engineering, Chinese Academy of Sciences in 2014 resulted in the discovery of a new population in Sanya, hydrological characteristics of which (such as water quality, water temperature and fishery resources) are different from other known habitats along the Chinese coast. This population may exhibit disparate habits and population structures with other populations. OPCFHK is now funding the Institute a three-year survey of the population from 2015 to 2018, with methodologies including photo identification, passive acoustic monitoring and biopsy sampling. Habitat change and loss, particularly where coastal development is intense, can affect the patterns of dolphin distribution and habitat use. Action plans drawn from sighting records only at certain periods of time will neglect to account for the accumulated impact on the dolphins. 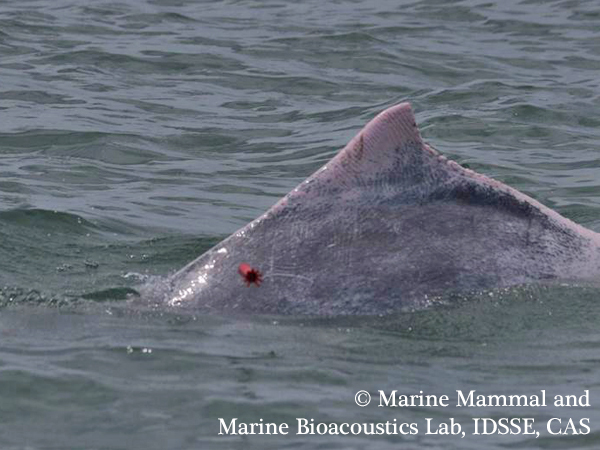 In Xiamen, the Taiwan Cetacean Society collaborated with The Third Institute of Oceanography, State Oceanic Administration with the use of satellite-based remote-sensing technology to examine the changes in distribution patterns and habitat loss / degradation for CWDs in Xiamen Bay, along with the extent and history of habitat loss. Results from the studies will provide a baseline for reference to assess the impact of habitat loss and degradation on population survival in the area. The CWD population inhabiting the PRE is recommended to be uplisted as Endangered (from Near Threatened) according to a publication from The University of Hong Kong in 2015, whilst there is also a recommendation from another research team to uplist all populations of CWD as Vulnerable. Whilst the result is subject to review by the IUCN Red List Committee, the degree of fragmentation and loss of habitat in the PRE is a worrying situation. 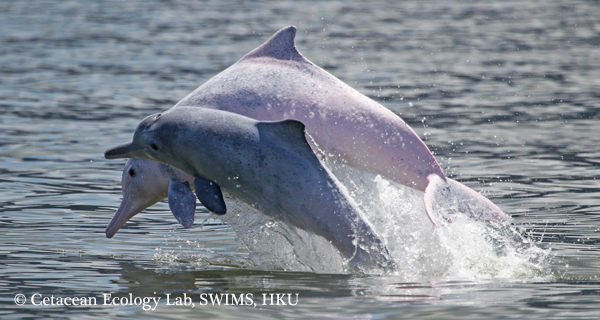 To scientifically demonstrate the magnitude of anthropogenic influences on its viability, OPCFHK has sponsored projects led by The University of Hong Kong and Sun Yat-sen University to investigate the dolphinsâ€™ habitat use, population structure, movement and sustainability in the region. 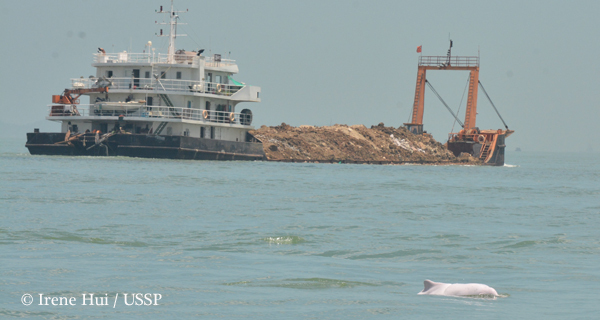 Read more about the efforts on the Chinese white dolphins we supported on pages 14 to 17 of the annual report. You could also read more about the regional efforts we supported, including projects on giant panda, Chinese crested tern, blue-crowned laughingthrush, Yangtze finless porpoise, Bornean orangutan, snow leopard and Chinese pangolin, as well as our local project, conservation education and stakeholder engagement efforts. We are glad to receive an update from Wildlife Conservation Society for a new published paper in Conservation Genetics titled â€œOceanic drivers of population differentiation in Indo-Pacific bottlenose (Tursiops aduncus) and humpback (Sousa spp.) dolphins of the northern Bay of Bengalâ€, which is a joint efforts of the American Museum of Natural History, Wildlife Conservation Society, and the Centre for Ecology, Evolution and Environmental Changes (Universidade de Lisboa). In the comparative study using DNA collected from both Indo-Pacific humpback dolphins (Sousa chinensis) and Indo-Pacific bottlenose dolphins (Tursiops aduncus) and data from previous genetic studies, the authors have found that both populations of both species are distinct from populations in other parts of the Indian Ocean and western Pacific. This discovery follows the recent description of a possible new species of â€œriver sharkâ€ in the same waters. â€œOur findings indicate that there is a connection between the presence of these distinct populations of dolphins and the unique oceanic habitat that is found in the Bay of Bengal,â€ said Dr. Ana R. Amaral, the lead author of the study. â€œThe combination of a biologically rich yet isolated seascape could be driving speciation, or the emergence of new species.â€ (Remarks: information above is extracted from the press release of Wildlife Conservation Society). 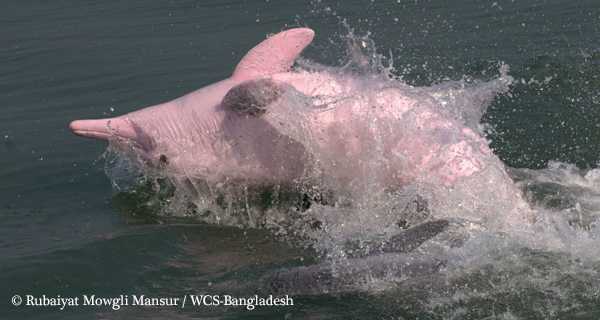 OPCFHK provided funding to support Wildlife Conservation Societyâ€™s project, including two studies on conservation genetics of humpback dolphins in 2003 and 2004, and four projects on the cetaceans in Bangladesh since 2006. Thank you our principal investigators, Mr. Brian D Smith, Mr. Rubaiyat M. Mansur and Dr. Howard C. Rosenbaum, for the efforts to protect the species and co-author this publication. The 7th year programme was launched with 30 schools joining. Half of the schools have started rearing the horseshoe crabs in late November, whilst the remaining half will start soon. In order to better prepare and engage participating students in the programme, OPCFHK organised three eco-tours at Ha Pak Nai where students learnt more about the speciesâ€™ biology, threats and conservation efforts. We focused on the type of marine debris found on this important natural habitat of horseshoe crab and other species, and a briefing session were held at the end of the tour to allow the students to reflect on the connection between their consumption habits and the plight of wild animals, and to find their own ways to help. As Ha Pak Nai is close to Mai Po Nature Reserve, we even sighted black-faced spoonbill in one of our visits. By protecting mudflat, not only are we protecting horseshoe crabs, we are also protecting an endangered migratory bird species together with many other precious species that share the same habitat. 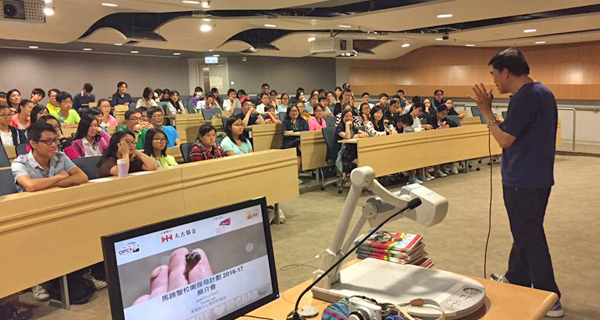 In the 2015/16 financial year, OPCFHK sponsored six students from Hong Kong Academy for Performing Arts to produce four short video clips to promote horseshoe crab conservation efforts, covering the animalsâ€™s biological features, its importance, how people in Guangxi, Hong Kong and Kinmen studied and conserved them, and how the younger generations are recruited to sustain the efforts. Check on the following links to view the videos. Every staff in OPCFHK strives to spread conservation message to wide audience and speak up for our animal friends who cannot speak up for themselves. Check out our website for the past issues. We need your help to sustain our efforts to conserve wildlife. Join us as our member of the Friends of the Foundation (download application form) to hel pus fund more conservation projects and save more species. Together we make a difference!